I was eager to try Calico, the newest addition to the bustling bar and restaurant scene in Shaw for a few reasons; it’s a bar, in Shaw, that’s decorated like an pastel pink 1960s style living room and backyard patio. Calico is the latest from Nathan Beauchamp and Greg Algie, the guys behind Fainting Goat and Tiger Fork. 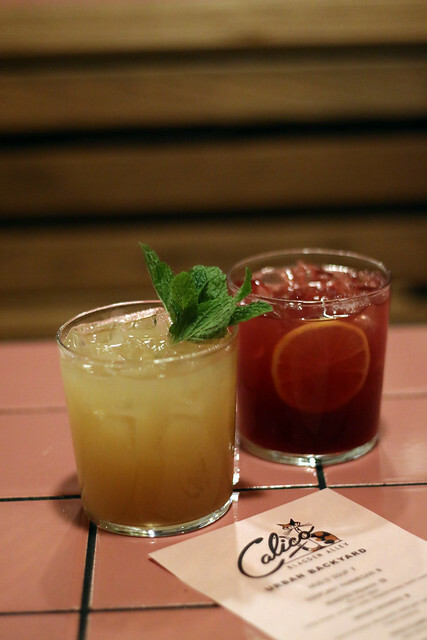 Calico opened last week and was warmly received—the bar was packed on a Thursday night just four days after its opening that Sunday. Built into a former boxing gym in Blagden Alley, the industrial space was designed by StreetSense’s Edit Lab and converted into your Grandmother’s retro pink kitchen: kitschy stools and floral bulbous light fixtures line a bar in the center of the space, and the seating is a mix of picnic tables and corner booths with pastel pink tile tables. Of course, I loved it. 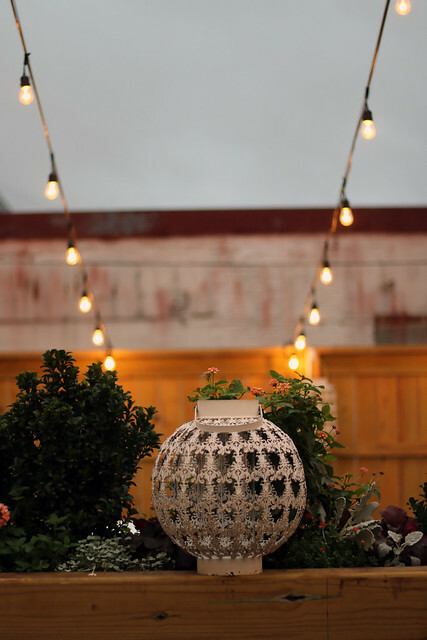 The outdoor space is the true winner: a wooden backyard patio with an outdoor bar accented by hanging metal lanterns and warmed by heat lamps. In the center, lies a steel greenhouse-like structure filled with charming little pink bistro tables for two and is available by reservation. It would be perfect for a girls’ brunch or birthday for about a dozen. The cocktail menu, served on a thin piece of paper with the restaurant’s Calico cat logo, is concise but thorough. There’s a selection of beers, wines, two draft cocktails, and four adult juice boxes. We tried both draft cocktails, and polished off each. The home run cocktail was the Magic Carpet Ride, crafted with Greenhat Gin, lemon, pomegranate, rose water, Cayenne tea, and honey. It was fresh, crisp and sweet, but not too sweet. The Fight Club cocktail comprised Bourbon, mint, lime juice, and ginger for a perfect mix of tart sour and crisp sweetness. Both had really great flavor profiles and were perfectly refreshing. These draft concoctions go down easily—this is definitely going to be one of my new favorite bars. The menu is meant to mimic a backyard BBQ, where your mother throws together dishes from whatever is available. But, instead of your mother, it’s the talented chef Nathan Beauchamp. 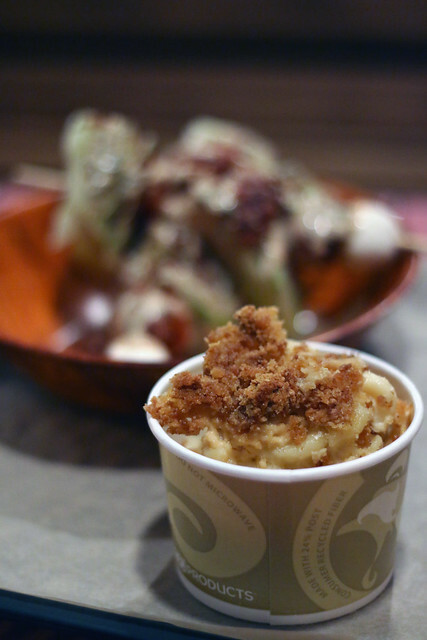 Our eyes seized on the mac n’ cheese—a classic cheddar cheese and noodle version topped with a cracker crumble. This was definitely baked in a casserole—appropriate for the backyard theme—and thus dense, cheesy and delicious. In an attempt to be healthy, we ordered the salad skewers, which came drenched in dressing —certainly not healthy but utterly delicious. 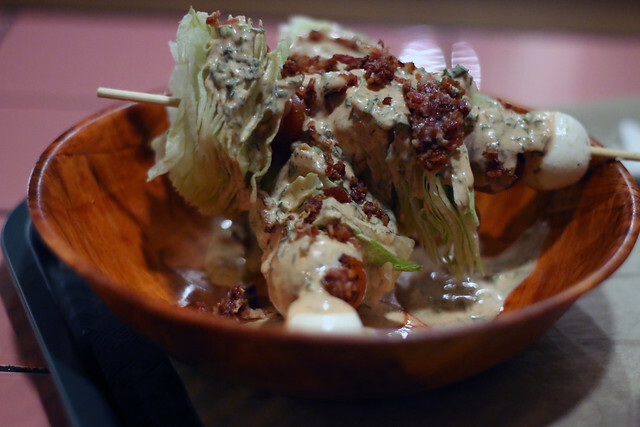 These are best described as a deconstructed wedge salad on a kabob: iceberg lettuce slices, mozzarella, and cherry tomatoes were covered in dressing and bacon sprinkles. When removed from the skewer, the ratio of lettuce to dressing was actually perfect—and turned into the perfect side salad. I was rather pleased. 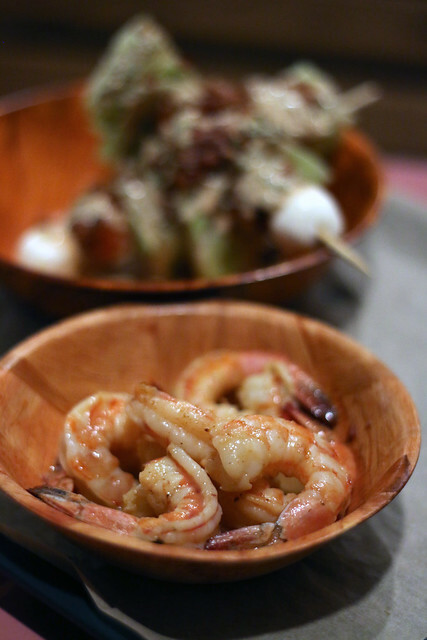 The half-pound shrimp are served peeled, with the tails on, in a savory beef jerky butter. That’s right, beef jerky butter. This is a delicious, savory appetizer that’s great for sharing. The home run of the evening was the roast pork; we decided to order the sandwich over the platter. And, I’m glad we did. Moist, thin roast pork was served on an immense, fluffy sesame seed hoagie roll, which was absolutely decadent. 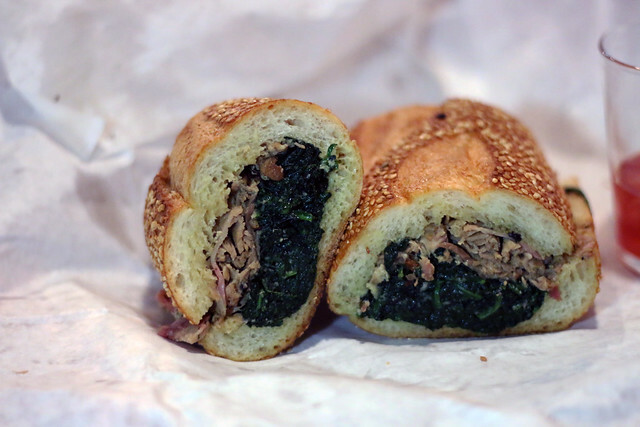 The roll was buttered and served with roasted spinach, which was a great combination. It made me feel like I was eating healthy and I relished each decadent, fluffy bite.